Of course, we took up the challenge and did it both ways. The younger limoncello has a brighter flavor. The more aged limoncello has a more complex and richer flavor. So perhaps it’s a matter of taste, but we now let ours do its thing for at least 3 months. We tend to make it in big batches, using 3 or 4 large mason jars. By the time we get around to bottling the last jar, it has sometimes been aging for 6 months or more. We also don’t make our limoncello quite as sweet as we used to. We started out using equal parts simple syrup and the lemon-alcohol mixture. Now we use a cup to a cup and a half for every 16 ounces of lemon-alcohol. I recommend starting off less sweet and adding more simple syrup if you feel like you need it. You can always add more, but you can’t take it out once it’s in there. The other very important thing to remember is to use the lemon peel but not the white pith, which can make the final product too bitter. We use a potato peeler and a light touch to peel the lemons. We end up with a small amount of pith, but it is negligible. Try to use organic lemons with no wax on them. If you can’t find those, there are products you can buy to remove the wax. Some people may start with just vodka and others start with PGA. Once you add the sugar, it will bring the proof down. So if you want a 40-60 proof liqueur, use vodka. If you want it to end up being 100 proof or more, use PGA. We use a mix of the two to end up with something closer to 80 proof. Mix a 750 ml bottle of 100-proof vodka with a 750-bottle of pure grain alcohol (Everclear) in a large mason jar (we split it into two 32-ounce jars with equal amounts of both liquors). Let that sit in a cool dark place for at a few months until you forget about it. It’s really nice to start it out in the summer and then rediscover it just in time for Christmas. Makes a good gift! Filter out the lemon peels using cheese cloth. Add simple syrup (1 cup of sugar to 1 cup of water) to taste and shake to blend. Bottle in a freezer-safe container and serve very cold. 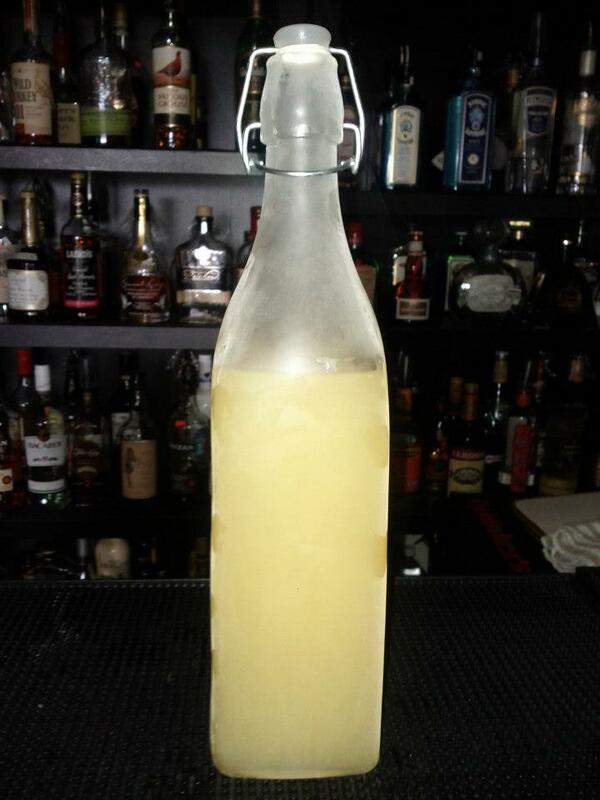 This entry was posted in recipes and tagged limoncello lemon liqueur.